Driving under the influence is a specialized and highly technical area of the law. What used to be considered a glorified speeding ticket, now is one of the most severely punished misdemeanors on the books. A person convicted of a DUI is facing jail, fines, alcohol classes, driver's license suspensions, points on the driver's license and higher insurance costs. When a driver is arrested for a DUI, the Department of Motor Vehicles takes an automatic administrative action on the driver's license. This is completely separate from the court process. A driver only has 10 days from the day they were arrested to request a hearing with the DMV. This hearing is called an "administrative per se" hearing and if one is not requested within the 10 day time frame, the right to a hearing is gone. Without a hearing it is virtually certain the DMV will suspend your driver's license. Those who have been charged with driving under the influence (DUI) may be deceived into thinking that it's a simple cut and dry matter. They already know about the fines, the points in their license and even the possibility of losing their license; however, they are not aware that there are other much larger and life impacting penalties that can be assigned with the DUI. While an experienced DUI attorney would be able to assess the case to see if these penalties would be included, many non-specialized lawyers are unaware, leaving the defendant to face the dark. In California, a DUI isn't judged simply by impairment, rather, it's viewed from a number of different angles. For example, should the person have been driving on a freeway 30 miles per hour over the speed limit, they can get an additional term of sixty days in jail. This is also applied if the person is only going 20 miles per hour over the speed limit on a street or a highway. These can be applied even if it is the person's first offense and in addition to the jail time, the person will be required to complete an alcohol / drug program even if a probation term wasn't assigned. If a parent or guardian has a passenger who's younger than the age of 14, more penalties can be assigned. If this is a first time DUI offense, the person will get 48 additional hours in jail. Should it be the second offense, the jail time increases to 10 days. The third offense warrants an even longer jail time extension: thirty days in jail. Should this be the person's fourth or more offense, 90 days of jail time will be added to the sentence. Even if the person was pleasant and listened to the officer during the time of the arrest, they can still be penalized if they refuse to take the chemical test. If the refusal occurred during the person's first DUI offense, they will receive an additional 48 continuous hours in jail and a one year driver's license suspension. The penalties become more severe if it is the person's second time: an additional 96 continuous hours in jail and a two year drivers license suspension. A third offense receives 10 days in jail while a fourth offense receives 18 days in jail. Without hiring a lawyer who specializes in DUI cases, the average person won't have the slightest idea how severe the penalties in their cases will be. A skilled DUI lawyer can examine the case with the client, look at all the angles and evaluate the potential penalties, and even find ways to reduce these penalties or eliminate them entirely. For those who think they can brave the courtroom alone, be wary: a DUI is not as cut and dry as it appears. If probation is granted, the person can expect to get a fine from between $390 to $1,000, along with some penalty assessments. They will also be required to attend a three month alcohol / drug program. They be required to attend a nine month program if their blood alcohol level (BAC) was .20 percent or more or if they refused a chemical test. They can also expect at least five days in jail and a six month driver license suspension. Should the person not be eligible for probation, they can expect the same amount of fines but the other penalties will be more severe. They will face 90 days to 1 year in county jail if the crime is labeled as a misdemeanor, 16 months to 2-3 years in state prison if it is labeled a felony, and one additional one year term for each additional injured victim and a one year driver's license suspension. If the person commits another offense within ten years of the previous offense, they can expect more penalties. If probation is granted, the person will get a three year license suspension which can only be changed by completion of an alcohol / drug program, a fine between $390 to $5,000 with penalty assessments coupled with 120 days to 1 year in jail, or a fine of $390 to $1,000 with penalty assessments and 30 days to a year in jail as well as required attendance at an 18 to 30 month alcohol / drug program. If probation is not granted, the person can expect a fine of $390 to $5,000 plus any penalty assessments, 120 to 1 year of jail time in a county jail if it is a misdemeanor, 16 months or 2-3 years in jail if it is a felony as well as an additional one year term for each additional injured person. This is topped off with a three year driver's license suspension. The penalties continue to increase in amount and severity the more times the crime is committed. While a person might believe they will receive probation simply because it is their first offense, it is not always a guarantee. This is why it is important to contact a lawyer who specializes in DUI cases as they will be able to properly analyze all aspects of the situation and find ways to cut back the severity of the penalties. While it's universally understood that a person should not drive while their license is suspended, revoked, or restricted, many believe they can get away with it regardless. Even though it is violating the law, many of these people are correct in that they are able to drive during this time and not get caught; however, not every person is so lucky. If a person should be arrested and charged with driving under the influence while their license is suspended, revoked, or restricted, they can face maximum penalties if they do not hire a specialized DUI lawyer who understands the vehicle code and penalty structure. If the person is a first time offender and they fall within vehicle code 14601, they can expect to receive five days to six months in jail, a $300 to $1,000 fine with penalty assessments, and a ignition interlock device will be installed if there is a plea agreement for a charge of VC § 14601.2. Should this be their second, third or more offense within five years of another conviction of VC §§ 14601, 14601.1, 14601.2 or 14601.5 they can face: 10 days to 1 year in jail, $500 to $2,000 in fines with penalty assessments and they will have to install an ignition interlock device if a plea agreement for a charge of VC § 14601.2 is reached. A first time offense with this vehicle code will get a person up to six months in jail or $300 to $1,000 in fines with penalty assessments. They may even have to install an ignition interlock device if there is a plea agreement for a charge of VC § 14601.2. Should this be the any other time after the first, a person can expect at least five days to one year in jail, $500 to $2,000 in fines with penalty assessments, and they will have to install an ignition interlock device if a plea agreement for a charge of VC § 14601.2. Regardless of which vehicle code a person falls under, there are other penalties that can be added to the final list. For a first time offense, a person could have their vehicle impounded for up to 6 months. Any time after the first offense can be even more costly: the vehicle may be impounded for up to one year or declared a nuisance and ordered to be sold. These are only a few of the vehicle codes and just some of the possible penalties that can stem from a DUI arrest when driving with a suspended, revoked or restricted license. A court appointed lawyer or a general practice lawyer will likely miss many tell tale flags that could potentially lessen the penalty of the offense. By hiring a skilled lawyer who specializes in DUI's, the case will be thoroughly analyzed from all angles and all potential penalties will be assessed and reviewed for the client's maximum benefit. Avvo.com is the nation's largest and most detailed attorney rating website. 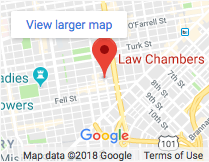 Adam Gasner is consistently the top-rated and best reviewed criminal defense attorney in San Francisco. San Francisco native Adam G. Gasner is board certified by the California State Bar as a specialist in criminal law – a distinction held by fewer than 400 of the more that 250,000 practicing lawyers in the state.